Huge upsets against conference rivals The College of New Jersey (TCNJ) and New Jersey City University (NJCU) have given the Rowan men’s basketball a boost late in the season. The brown and gold put a four-game home winning streak on the line when they hosted the Lions on Feb. 1. TCNJ had won their last seven in a row, and are currently placed second in the New Jersey Athletic Conference. The brown and gold came out of the gate firing, and held the lead for the entire contest. Five players scored in double-figures, including Nick DePersia. The sophomore guard scored 21 points, 15 of which came from beyond the arc. His streak of 20-point outings was extended to three as Rowan beat the Lions 88-74. The brown and gold followed that contest up by hosting NJCU on Feb. 4. The scoring frenzy didn’t stop for DePersia, as he poured in 24, and brought his streak of 20-point games to four. He was joined by freshman guard, Jeff Haddock, as both contributed five points each in Rowan’s 14-0 late-game heroic run to help them come from behind and defeat the Gothic Knights, 91-88. Haddock tallied 24 points, giving him a new season-high, and went 8-12 from the charity stripe. 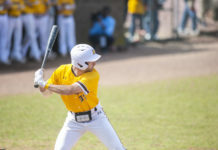 On Feb. 8, Rowan took to the road to face struggling Kean University, who clings to a 1-21 overall record, their only win being in-conference against Rutgers-Newark. Prior to the game, Crispin said that in a game like this, it is important not to get too high or too low. The brown and gold did just that, winning the game against Kean 96-85. The win moved the team to 15-8 and 10-6 in the conference. Rob DePersia led the Profs with 16 points while four other players scored in double figures. 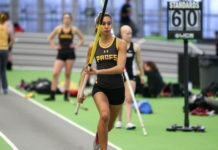 The Profs will next face Rutgers-Newark on Feb. 11 at 8 p.m.